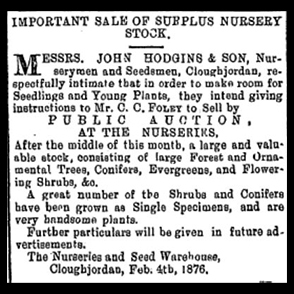 John Hodgins & Son operated a very successful plant and seed nursery in Cloughjordan in the latter half of the 19th century. As may be seen from the wonderful collection of seed catalogues, postal requests and letters from clients from all parts of Tipperary and indeed further afield, the detail from the letters show that the Hodgins family attended to all requests promptly. 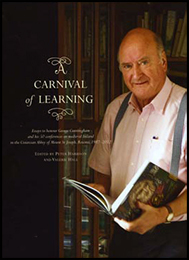 The collection as presented here has not been sorted into any order, but has been scanned in the format as donated with kind generosity by Dr George Cunningham, Roscrea. Indeed, were it not for the care which George afforded to the letters and catalogue sheets, this collection may have been lost forever. The range of plants and seeds which John Hodgins and Son provided to his clients, the price lists and the nature of the whole business give a fascinating insight into the social and rural life of not only Cloughjordan but much of Ireland at this time. Also part of the collection of material relating to North Tipperary donated by Dr George Cunningham, Roscrea are a large selection of bill heads and receipts from various businesses in the towns and villages in the late 19th and 20th century. The bill heads evoke memories of halcyon days and are indicative of the wide range of goods, materials and services available locally. They also chronicle the advent of transport improvements and inventions with garage receipts indicative of the advent of the motor car into Tipperary.